This article is about the Futurama character. For the actress, see Lucy Liu. Lucy Liu's head is the head of 21st century actress Lucy Liu. For much of her life, Liu has been at Kidnappster.com, where they have been holding her prisoner since 2203 (3ACV15). During 800 years, many people downloaded illegal copies of her. After being rescued by Bender in 3003, Liu began a relationship with him, and was last seen living inside his case (4ACV03). Her current status is unknown. Her exact age is unknown. If Liu was living inside Bender ever since 3003, then she is thousands of years old (BBS). Otherwise, she is 1050. 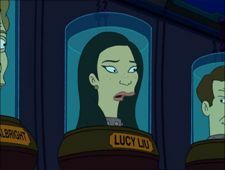 The Liubot was a computer-generated duplicate of Lucy Liu that was downloaded by Fry. Later, a swarm of them were sent to kill the Planet Express crew by the Kidnappster CEO after Bender stole Lucy Liu's head from the company. It is believed that, after the attack, all Liubots were destroyed. She was apparently inside Bender during the Roswell incident, though Bender may have taken her out of his chest before that episode and put her back before her next appearance. She owns the largest gold nugget in the world, which, besides her image, is all she has. Lucy Liu's head: Are you the last copy of me? Liubot: [In a weak voice.] Yes. Lucy Liu's head: Erase her, Fry. Lucy Liu's head: Fry, when you downloaded her without my permission, you stole my image, and in the end that's all I really have. That, and the largest gold nugget in the world, one mile in diameter. Liubot: [monotone] I am Lucy Liu. Give me your spines. Liubot: I'll always remember you, Fry. [In a Robotic voice.] Memory deleted! Liubot: Oh, Fry! I love you more than the moon, and the stars, and the... [In a Robotic voice.] Poetic image number 37 not found! Lucy Liu's head: Who are you talking to? Bender: No one, baby! Lucy Liu is the only girl for Bender. This page was last edited on 28 July 2013, at 18:40.